Usually when I attend any book events it means a long journey by car or train, however yesterday I went to a really great little day in Bristol. 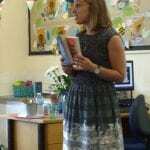 It was hosted by Horfield Primary School who have been gaining a reputation for their emphasis on reading; in fact, last year they were the winners of the UKLA Literacy School of the Year award. It was lovely to walk around the school and see the examples of ‘good practice’ that they were taking on board, so that pupils are constantly reminded of the joys of reading. There was a very full programme of events during the day and I managed to fit in five of the authors and illustrators. Firstly I saw the truly inspirational Andy Seed, who is well known for his series of very funny but informative books about a wide range of topics. 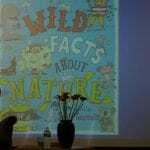 Yesterday he used the event to launch a new wildlife book entitled “Wild Facts about nature” which he has written in conjunction with the RSPB. Andy is a really funny speaker who had the audience of both children and adults in fits of laughter. The session was very interactive with helpers being persuaded up on to the stage to help with the explanations and quizzes found in the book. 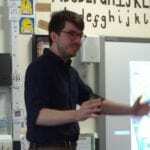 If anyone is looking for a really superb author to connect with their primary pupils then Andy Seed comes highly recommended. My next session was with the lovely Amy Wilson who has made quite a stir with her book “A girl called Owl” and her latest “A Far away Magic“. 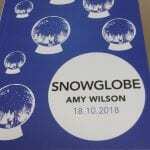 She also introduced us to her next book “Snow globe”, which will be published in October, ready for the Christmas market. This was a very interactive workshop, with Amy working with the children to think around the concept of Magic. It was really lovely to hear from the children about what they had been inspired to write. Given the emphasis that there is on writing within the curriculum this was a brilliant way to enthuse children, without making it feel like ‘work’. Ross Montgomery is a very talented young author and has produced books for a wide range of ages; these range from picture books such as “Space Tortoise” to his new book “Max and the Millions“. 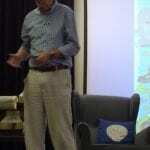 This workshop was for what is often called ‘middle grade’ readers and was centred around ‘Max’ and how Ross created the world at the centre of the story. The children had to imagine they were only the size of a grain of rice and then think about how they would describe objects they see when entering a new space/room within a house. It was fascinating to hear their thoughts and to try and visualize the process for yourself. 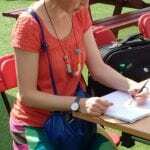 Even though these workshops are intended for a children’s audience, they are so useful for adult who want to write, or who work with children in an educational setting. 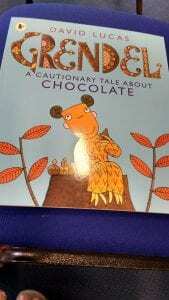 The largest event of the afternoon was that with S F Said who is well known in most primary schools for his books about a cat called “Varjak Paw” and many of the children in the packed audience would have read the book in school. The author spoke about his journey into writing and it was fascinating to hear that he had also suffered book rejections in his time. He also admitted that his understanding of the writing and publishing process had to develop over time, especially the fact that writing ‘The End’ means it is the End of the beginning process. Thing such as agents, editors, drafts and re-writes were something that he had to learn about and take on board in order to achieve success. His latest book “Phoenix”, which has been out for several years now, took seven years to write and is on a much larger scale than his first works. It is a fantastic space odyssey, which I really loved. The children had lots of questions at the end of the session and we heard that there will be a third Varjak Paw at some time in the future, but only when S F is older! My final session of the day was with the delightful Chris D’Lacey who is so well know for his wonderful “Last Dragon” series, of which I am a great fan. 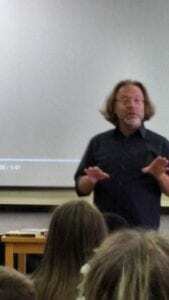 He spoke about how he started writing and the book that first brought him attention as an author “Fly Cherokee, Fly” which was listed for the Carnegie medal. When his publisher asked for another book on a similar theme, with squirrels , he was also asked what was the occupation of the landlady where the central character was living. By a very circuitous route he came up with her being a ceramicist who makes models of dragons; the series was born. Chris also spoke about his two later series “The Unicorne Files” and “Erth Dragons”, both of which are possibly for slightly older audiences. There were six other authors and illustrators that I was unable to sit in on, but I was lucky enough to speak to several of them when they were signing or just enjoying the atmosphere. Mini Grey (“The Last Wolf”), Leigh Hodgkinson (“Are you sitting comfortably”), Emma Randall (“The twelve days of Christmas”) and David Lucas (“Grendel”) are all superb picture book creators and it was a shame that I did not get time to hear them speak. However based on their charming way with their audience, I will try and get to listen to them in the future. I also want to know why Mini was wearing little furry ears! John Hegley (“I am a Poetato”) is very well known as a poet and I had the pleasure of hearing him speak at a conference a couple of years ago. 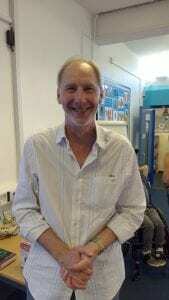 He is full of energy and his use of language is amazing, I would highly recommend him for schools. This recommendation also applies to the final speaker that I did not see, however I have also seen him in the past. 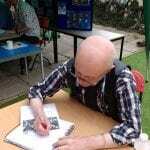 This is Kjartan Poskitt, a man who can make mathematics really interesting, amusing and even understandable. 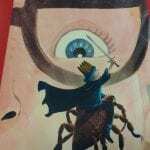 His books about “Murderous Maths” are a staple of most libraries and schools and like “Horrible Histories” they are very popular with the intended audience. To listen to him is a real experience and I would have loved to catch some of his event. 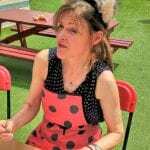 Overall this was a really lovely day and I would like to give a big thanks to the organizers and staff at Horfield Primary School for putting it all together, as I know how much effort must have gone into the day. 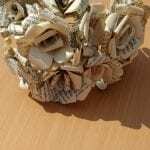 I particularly loved the small bouquets of flowers, crafted from old books by the children, that were given to each author. It was advertised heavily on Twitter and in Bristol so I am sure that it must have been a disappointment that the audience was not as broad as it could have been. However I did see several friends and had the great pleasure of meeting a Twitter friend, Brindy Wilcox, who is a self published children’s author and lives a few miles from me. It really was a wonderful celebration of children’s books and the fantastic wealth of authors and illustrators that we have in this country. Those of you in the area who did not attend missed a real treat.